Hardware. 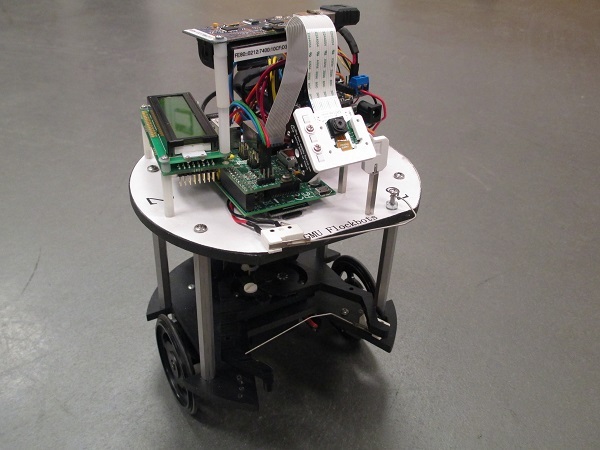 The robot design is a two-platform differential drive robot with a caster. The drive motors are servos modified for continuous rotation. The robot has two additional servos, one to control a large gripper on the bottom platform, and one to tilt a Raspberry Pi camera on the top platform. The gripper is recessed into a "gripper well" on the bottom platform to keep it from snagging on objects. The top platform also has a flat front to allow for pushing of taller boxes. Power. The robot has a removable 6-C-cell NiMH battery pack and a rocker-style power switch. The battery pack provides sufficient power for three hours of hard labor. Sensors. The design employs five Sharp IR distance sensors and can sense objects up to two feet away. A bump sensor in the gripper well indicates the presence of a grippable object, and a bump sensor on the top platform indicates that there's something to push or that a surface has been reached. Both wheels sport WheelWatcher shaft encoders for dead reckoning. The Raspberry Pi camera permits simple image recognition, color tracking, and other basic facilities. Microcontrollers. The motors, IR sensors, and bump sensors are presently controlled by an Arduino Uno microcontroller, which in turn is controlled via serial from a Raspberry Pi computer. The Arduino can control up to 14 digital inputs/outputs and six analog inputs. Notably, the robot also provides two USB ports, of which one is used to add Wi-fi and the other is used for attaching Tmote Sky or Zolertia Z1 802.15.4 sensor motes. Purchase. All the parts were purchased off-the-shelf from existing hobbyist robot companies or other vendors. We tried to minimize the number of custom items. At present the robot has three custom parts: the two platform decks were cut to specification by Budget Robotics and the bracket holding the Sharp IR sensors was fabricated from aluminum flashing. The sensor brackets have just been redesigned for fabrication in a 3d printer and will be updated on this site once the final bracket has been vetted. A PartsList is provided for reference.